FP7 projects must have a Gender Action Plan (GAP), reflecting the European Commission’s desire to promote gender equality as a mainstream issue. The enviroGRIDS Gender Committee aims at ensuring gender equitability, defining specific women needs and proposing appropriate solutions (mobility, meetings) and actions to the Coordination and Management team and the Project Management Board. It is composed of three members elected amongst partners. The reports on Gender issues in enviroGRIDS can be find below if you are logged in. Links to resources for women in science can be found on the website of our partner project ACQWA. The core environmental problem of the Danube River Catchment can be described as “ecologically unsustainable development and inadequate water resources management” (PCU 1999). The problems are caused by different factors, such as: inadequate management of wastewater/solid waste, ecological unsustainable industrial activities, and inadequate land management and improper agricultural practices. They generate several direct consequences: pollution of surface/groundwater, eutrophication, and accelerated runoff /erosion. These consequences have, on the other hand, the following main effects: decline in quality of life, human health risks, degradation of biodiversity, economic decline, and reduced availability of water. The Black Sea itself is also affected by severe environmental degradation. In 1995, it was rated with the highest concerns in five out of seven environmental categories, making it the worst of any of the European seas (Stanners and Boudreau 1995). Some signs of recovery have been observed in the last years, but eutrophication remains a severe problem. 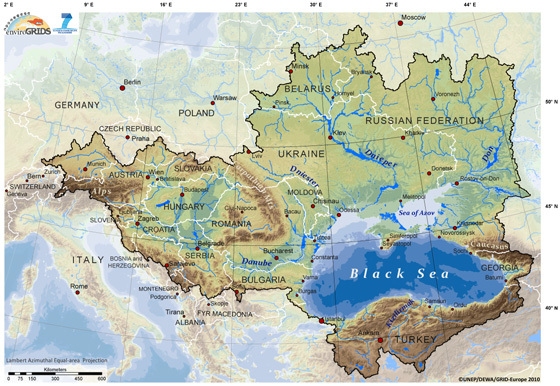 The Black Sea Hydrological Catchment (see Figure below) represents a very interesting case study to test the capacity of integrating large data sets to assess vulnerability and sustainability issues related to freshwater resources as various scales. The project is therefore essentially concentrating on the terrestrial part of the Black Sea Hydrological Catchment, not to be confused with the marine part often considered when using the Black Sea Basin terminology. General objectives: The scientific aim of the EnviroGRIDS project is to assemble an observation system of the Black Sea catchment that will address several GEO Societal Benefit Areas within a changing climate framework. This system will incorporate a shared information system that operates on the boundary of scientific/technical partners, stakeholders and the public. It will contain an early warning system able to inform in advance decision-makers and the public about risks to human health, biodiversity and ecosystems integrity, agriculture production or energy supply caused by climatic, demographic and land cover changes on a 50-year time horizon. provide policy-makers and citizens with early warning and decision support tools at regional, national and local levels. build capacities in the implementation of many new standards and frameworks (INSPIRE, GEOSS, OGC,..). Beyond state-of-the-art: EnviroGRIDS is clearly going beyond the state of the art in the Black Sea region by adopting a catchment approach and by tackling several societal benefits areas together. By using the most powerful computer network of the world it is clearly showing the direction on how to analyse the increasing amount of global data made available throughout the planet. It is bringing crucial information in a relatively data-poor region on future scenarios of expected climate, demographic and land cover changes. Based on the outputs of these scenarios it is building geoprocessing services in key societal benefits areas that will be connected back to the GEOSS. Streamline data process from data warehouses, to scenarios, hydrological models, impacts assessments and finally to disseminations tools.